To date, we’ve never had a five-year period of underperformance, having managed 43 times to surpass the S&P over such a stretch. … But the S&P has now had gains in each of the last four years, outpacing us over that period. If the market continues to advance in 2013, our streak of five year wins will end. One of the basic principles of accountability involves setting objective criteria for success or failure in advance and then periodically assessing actual results. Anyone who spends significant time examining potential investments knows that the majority of shareholder letters and annual reports tend to be filled with pages of content developed by public relations specialists rather than a frank assessment of business results delivered by the CEO. Warren Buffett’s 2012 annual letter to shareholders is a good example of how CEOs should accept accountability. Mr. Buffett reported on Berkshire’s “subpar” year as measured by criteria he set in advance and predicted that 2013 could also be “subpar” based on the same criteria. Although Berkshire’s stock price in 2013 was roughly even with the S&P 500 total return, it appears almost certain that Mr. Buffett will have to issue another mea culpa when Berkshire’s annual report is released at the end of next month. This is because Berkshire’s criteria is more involved than simply comparing Berkshire’s stock price performance to the S&P 500 on an annual basis. In this article, we examine the criteria and assess whether the self-criticism is warranted. Even the best standards must occasionally be revisited to ensure that the underlying assumptions made long ago are still relevant. I should have written the “five-year rolling basis” sentence differently, an error I didn’t realize until I received a question about this subject at the 2009 annual meeting. When the stock market has declined sharply over a five-year stretch, our market-price premium to book value has sometimes shrunk. And when that happens, we fail the test as I improperly formulated it. In fact, we fell far short as early as 1971-75, well before I wrote this principle in 1983. A cynic might argue that changing the terms of the rule after the original wording would have called for paying out dividends could be self serving but Mr. Buffett’s record clearly enhances his credibility when it comes to realigning the test with what he says was his original intent. The wording of the revised test requires two conditions to be true: First, Berkshire’s book value per share gain must exceed the performance of the S&P 500 over a five year rolling basis. Second, Berkshire’s stock must consistently sell at a premium to book value. Despite Berkshire’s significant price-to-book value compression in recent years, the stock has continued to sell consistently above book value. However, as we will discuss in more detail, Berkshire’s five-year gain in book value per share is almost certain to fall short of the performance of the S&P 500 when 2013 results are published next month. Mr. Buffett’s 2012 letter to shareholders noted that Berkshire’s increase in book value per share was less than the S&P 500’s gain for the ninth time in 48 years. However, at the time of the letter, Berkshire still had never experienced a five year period of underperformance as demonstrated by a table on page 103 of the annual report. The closest Berkshire has come to failing the test in the past was for the period spanning 2003-2007 in which Berkshire’s 13.3 percent annualized gain in book value per share only modestly exceeded the S&P 500’s annualized gain of 12.8 percent. The exhibit below presents actual results for Berkshire Hathaway’s book value per share growth from 2009 to 2012 along with our estimate for book value per share growth in 2013. Along with Berkshire’s results are the actual total return figures for the S&P 500. Although Berkshire’s 2013 annual report has yet to be released, it is a near certainty that the five year rolling period from 2009-2013 will reveal that Berkshire’s annualized book value per share growth has trailed the performance of the S&P 500. As a result, the retained earnings test (as revised) will not pass for the first time in Berkshire’s history. One thing of which you can be certain: Whatever Berkshire’s results, my partner Charlie Munger, the company’s Vice Chairman, and I will not change yardsticks. It’s our job to increase intrinsic business value – for which we use book value as a significantly understated proxy – at a faster rate than the market gains of the S&P. 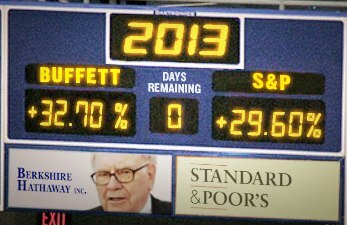 If we do so, Berkshire’s share price, though unpredictable from year to year, will itself outpace the S&P over time. If we fail, however, our management will bring no value to our investors, who themselves can earn S&P returns by buying a low-cost index fund. Although it appears that the retained earnings test will not change, there are a number of reasons to believe that the underlying metrics are becoming less relevant to Berkshire. The most important point is that the test uses Berkshire’s change in book value per share as a proxy for changes in intrinsic value. However, as Mr. Buffett has pointed out, book value is a flawed proxy and significantly understates intrinsic value. The argument for continuing to use book value as a key metric is that percentage changes in book value will approximately percentage changes in intrinsic value over time even as book value remains an understated proxy. While using book value as a proxy may have worked adequately at a time when most of Berkshire’s value resided in publicly traded securities, it appears outdated now that Berkshire has accumulated a large collection of wholly owned operating companies. The market value of Berkshire’s stock holdings are marked to market at each financial reporting date but the market value of wholly owned subsidiaries are not similarly marked. A prime example can be found by examining Berkshire’s decision to acquire Burlington Northern Santa Fe in 2010. The merger was completed nearly four years ago in February 2010 and since that time the common stock of Union Pacific, the closest comparable public railroad, has appreciated by over 170 percent. In contrast, the book value of BNSF on Berkshire’s balance sheet has only changed based on the amount of earnings retained within the business. 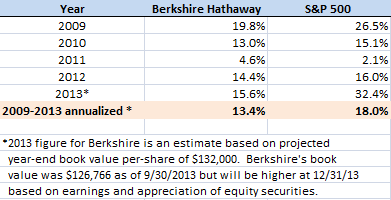 None of BNSF’s increase in market value is reflected in Berkshire’s book value. This fact alone indicates that Berkshire’s current book value could be understated by tens of billions of dollars. There are many other distortions to book value that individually have relatively minor impacts but can have aggregate impacts that serve to widen the gap between book value and intrinsic value over time. For example, in Mr. Buffett’s 2012 letter to shareholders, he describes the perverse accounting treatment that was required when Berkshire increased its interest in Marmon to 80 percent. GAAP accounting required the incremental purchase to be immediately recorded at far less than what Berkshire paid. Similar purchases resulted in a $700 million write off in 2012 that served to grow the gap between book value and a realistic assessment of intrinsic value. Mr. Buffett never explicitly outlines the consequences of failing the five year retained earnings test but the logical outcome would be a return of capital if one takes the language in the owner’s manual at face value. Over the past five years, Berkshire has in fact returned a small amount of capital to shareholders in the form of modest repurchases. However, the repurchases represent only a tiny fraction of total net income. For the four and three-quarter years through September 30, 2013, Berkshire had net income of over $60.5 billion. Put another way, nearly 44 percent of all earnings Berkshire has retained through its history have accumulated in under five years. It seems unwise to examine the past five years outside the context of the extraordinary macroeconomic environment that has prevailed throughout the period. In particular, the force of unprecedented easy monetary policy has served to encourage fixed income investors to seek positive real returns in equities and other riskier investments. While we do not know of any way to quantify the portion of the rise in equity markets attributable to Federal Reserve engineering, it is plausible that the impact has been substantial. As Mr. Buffett has repeatedly noted, Berkshire is built to shine in periods where stock markets are not going straight up. Over the next several weeks, speculation is likely to increase regarding the possibility of a dividend payment due to the failure of the five year retained earnings test. While we admire Mr. Buffett for setting standards in advance and sticking to them, it would be perfectly understandable to defer any decision on dividends for the time being. Other than the significant tax consequences to shareholders, removing capital from Berkshire at this time could be counterproductive if it limits Mr. Buffett’s flexibility in the midst of a market decline. The retained earnings test might be better formulated to incorporate Berkshire’s performance relative to the S&P 500 over a full market cycle. Amazon Reports E-Book Sales Exceed Hardcovers; Where is the Tipping Point? Anyone with B shares (or Buffett millionaires with A shares) can readily tap into as much of a dividend as desired by selling. If the shares have been owned for more than a year, so much the better for avoiding taxes. As always, enjoy reading your commentary. Always refreshing, always full of insights. Good luck with your endeavors.